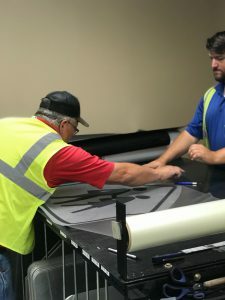 Montgomery County Precinct 3 Commissioner James Noack is partnering with local law enforcement to increase awareness of crosswalk safety and laws for motorists, pedestrians and cyclists in the community. Since 2015, there have been more than 60 reported motor-vehicle accidents involving pedestrians and bikers in South Montgomery County; and as the new school year approaches, Commissioner Noack is urging drivers and pedestrians to pay attention at crosswalks.  “The Montgomery County Sheriff’s Office will be working closely with Commissioner Noack’s office, as well as pedestrians, bicyclists and motorists alike, to increase safety and reduce accidents,” Sheriff Rand Henderson said. 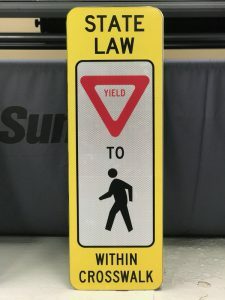 The Precinct 3 traffic operations team is installing pedestrian crossing signs in school zones and at non-signalized intersections precinct wide to reinforce the existing laws in the Texas Transportation Code. The traffic operations team also is working to install more flashing yellow lights in school zones that indicate when a school zone speed limit is in effect. 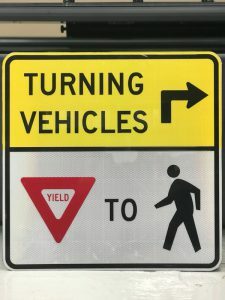 The Texas Transportation Code (Chapter 552.003) states that the operator of a vehicle shall yield the right of way to a pedestrian crossing a roadway in a crosswalk if there is no traffic control signal in place or in operation. 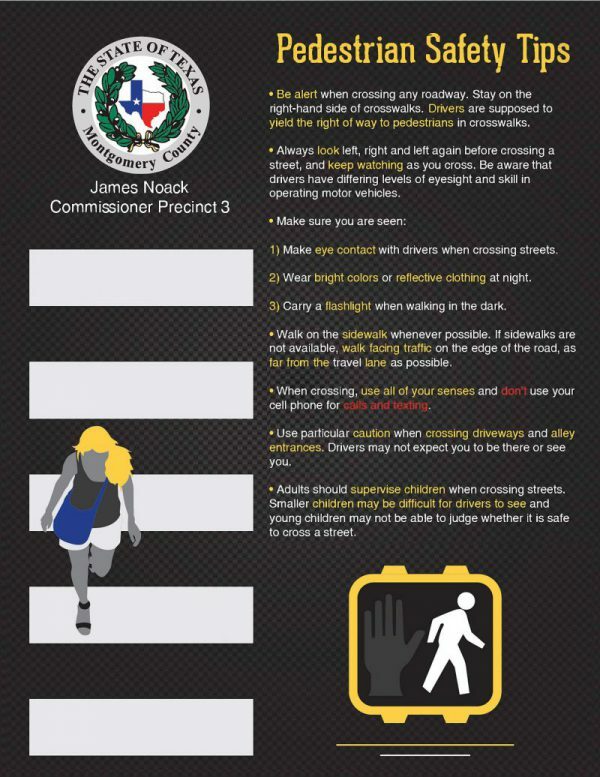 To read the entire pedestrian section of the Transportation Code, visit https://statutes.capitol.texas.gov/Docs/TN/htm/TN.552.htm. Commissioner Noack’s office also is working on improving sight lines and providing optimal visibility at these intersections by clearing excess debris, brush and greenery hanging down in the right of way.